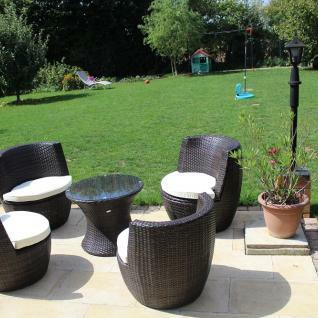 The Bologna is a practical and light garden furniture set that can installed wherever you want. The chairs and table stack on top of each other, forming the shape of an amphora. It is a very practical storage solution. Superb quality and weather-resistant, polyrattan is a trendy material. Its resemblance to natural rattan gives the Bologna a chic and modern look. This allows it to be installed both indoors and outdoors. The cushions are very elegant, thanks to their piped edges. With its 6 cm thick cushions, the Bologna offers a comfortable seat for you to enjoy your terrace or balcony. 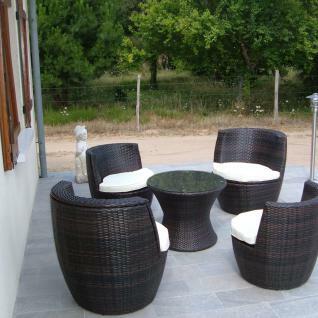 Alice's Garden carefully selects the quality of the material chosen for the polyrattan. As a result, the life of the Bologna is exceptional! Alice's Garden polyrattan is resistant to sunlight and bad weather (snow/rain/salt water). The cushions are removable and waterproof. The covers have a density of 180g/m². To prevent rust from developing, the metal structures are made of reinforced aluminium. The glass top of the coffee table is made of 5mm thick frosted tempered glass.